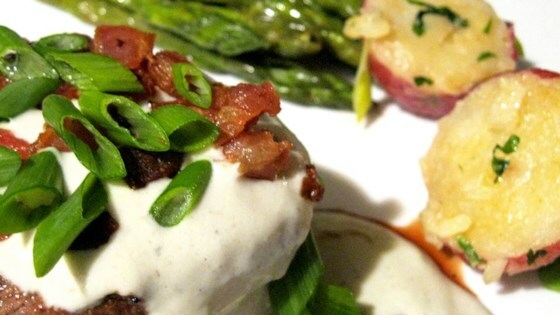 "Tender filet mignon is drizzled with a savory gorgonzola cream sauce and topped with crumbled bacon bits and sliced green onions." Pour heavy cream into a saucepan and bring to a boil over medium heat. Reduce heat and simmer until the cream has reduced by half, stirring occasionally, about an hour. Remove from heat and whisk in the Gorgonzola cheese and Parmesan cheese, salt, pepper, and nutmeg, until the cheese has melted. Season the beef tenderloin with lemon pepper, garlic powder, onion powder, salt, and pepper. Set aside. Place the bacon in a large, deep skillet, and cook over medium-high heat, stirring occasionally, until evenly browned, about 10 minutes. Drain the bacon on a paper towel-lined plate. Cook the steaks until they start to firm, and are reddish-pink and juicy in the center, 3 to 5 minutes per side. An instant-read thermometer inserted into the center should read 130 degrees F (54 degrees C). Remove the steaks from the grill and tent with foil to rest for 5 to 10 minutes. Serve each steak with the Gorgonzola sauce and top with crumbled bacon and chopped green onion. Elegant and juicy filet mignon. Seriously amazing. The only change we made was using chives in place of the green onions because we have a ton of those growing in our garden. YUM!!!! Great sauce recipe. I added sun dried tomatoes and black olives to it.